Posts tagged " Judaism and heaven "
Twitter is often the platform of ignorant blathering and best ignored. But when the tweet is by someone who is White House Correspondent for The New York Times and it concerns Judaism, we think it worthwhile to publicly refute it. We understand that not everyone loved President Trump’s State of the Union speech as much as we did. 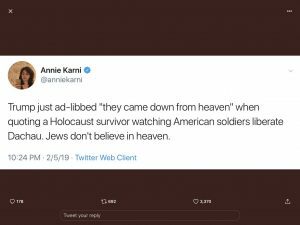 Yet Annie Karni objected to the president’s words when he quoted a Holocaust survivor saying, “They came down from heaven,” about the American troops who liberated him from the Dachau concentration camp. Note to Ms. Karni. Judaism does teach of Heaven—rather extensively. Those Jews who are faithful descendants of our ancestors believe in an afterlife, Heaven, and judgement after death. We acknowledge that many Jews, tragically, often know little of the traditional, vibrant and enduring faith that is their heritage. So, we think you made an honest mistake, but as an intelligent woman we encourage you to expand your education. There’s a wonderful world of Judaism waiting for your exploration. Perhaps you will join us for a Shabbat dinner and we can talk further.